Oh, how I love buddy reads! Chickadee and I agreed to read A Cupboard Full of Coats. On my TBR for over five (5) years, it was high time to give it a read. The cover and title seemed inviting. Jinx's mother was murdered in her East London home about 14 years ago. Overwhelmed with guilt, Jinx never fully dealt with what happened and the part she played in her own mother's death. An old friend of her mother's, Lemon, shows up unannounced, forcing Jinx to confront the past. They slowly revisit events leading up to that particular night. Over the course of one weekend, Jinx and Lemon unravel emotions, jealousy, violence and family drama. This is a safe space so I won't sugarcoat my review. 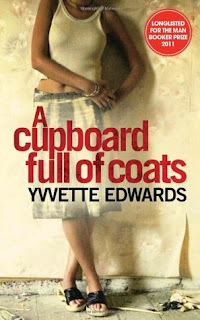 We did not like A Cupboard Full of Coats as much as Yvvette Edwards' other book, The Mother. It was very repetitive with unnecessary dialogue and background. In the beginning pages, I was anxiously waiting for the climax but lost interest by the time it was revealed. I was tempted to skip ahead but was curious enough to see whether the plot would pick up. I was ready for something dramatic and jaw-dropping. Instead it was ordinarily predictable. There are almost 2,000 positive reviews for this novel but...nope.